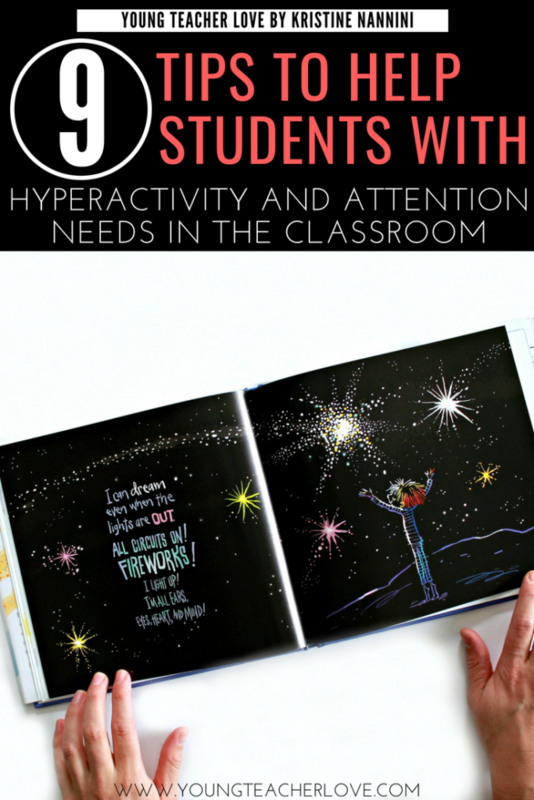 I’m here to share 9 tips to help students with hyperactivity, ADHD, or other attention needs in your classroom. 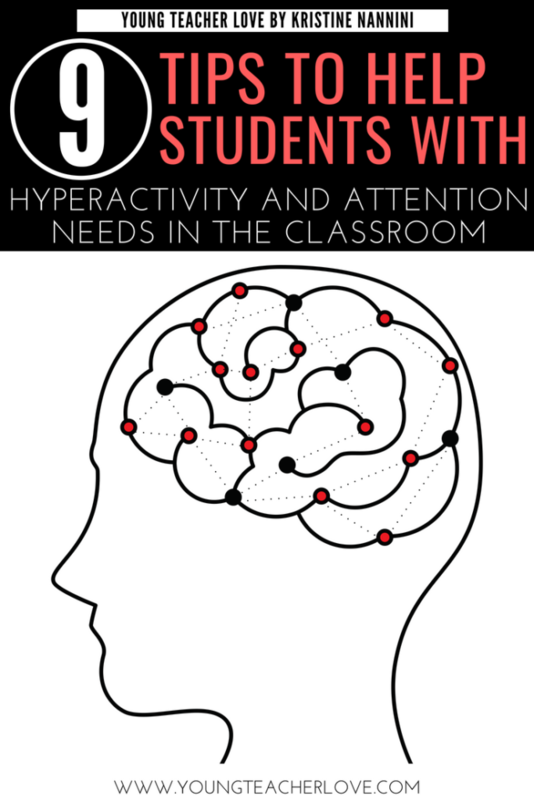 School can be a difficult place for students with hyperactivity, ADHD, or other attention needs. Their academic success depends heavily on their ability to pay attention and control behavior and impulses. Children with attention needs or hyperactivity are in constant motion both physically and mentally. They often find it very difficult to complete or start long assignments due to the extended period of focus and sitting that is required of them. Remember, these behaviors are not a choice for the student. They are symptoms of a brain-based disorder. Simply telling these students to stop talking, sit still, or calm down, is not helpful, productive, or fair to the student. The student would love to simply follow your commands, but they can’t help themselves. 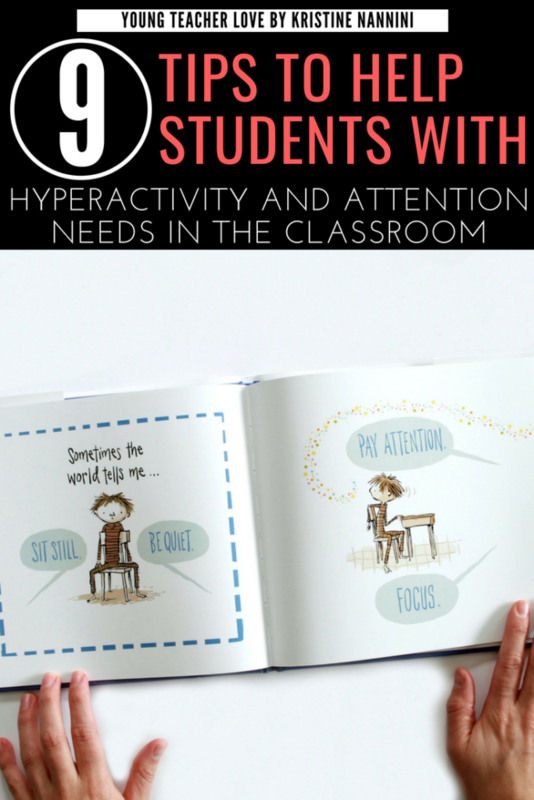 Students with hyperactivity or attention needs sometimes lack impulse control and often struggle to focus and self-monitor. However, if you proactively implement a few simple strategies, you could see a major difference in these students’ achievement levels. 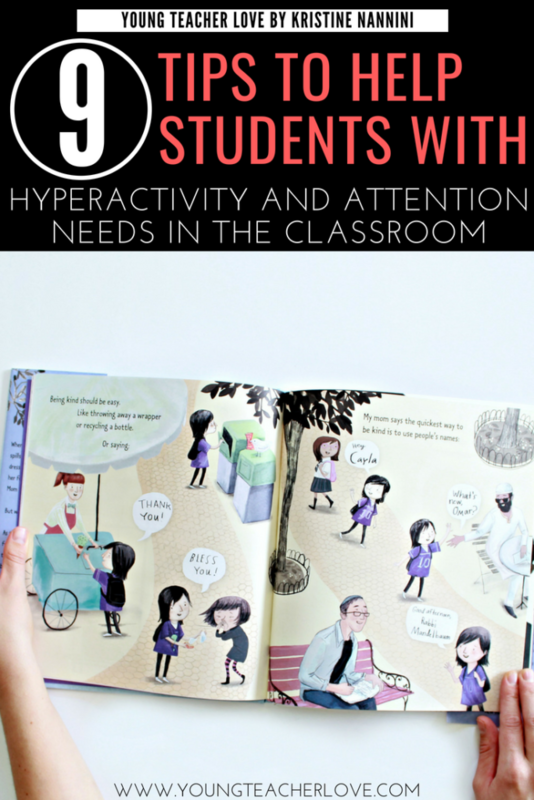 One of the biggest mistakes that I made early on as a teacher was making assumptions about students with hyperactivity, ADHD, or other attention needs. When I learned that one of my new students had particular attention needs, I immediately thought I knew the problem and started differentiating for the student. That strategy was very frustrating for both of us. Over the years, I learned to closely observe my students to figure out what specific things were hard for him or her. 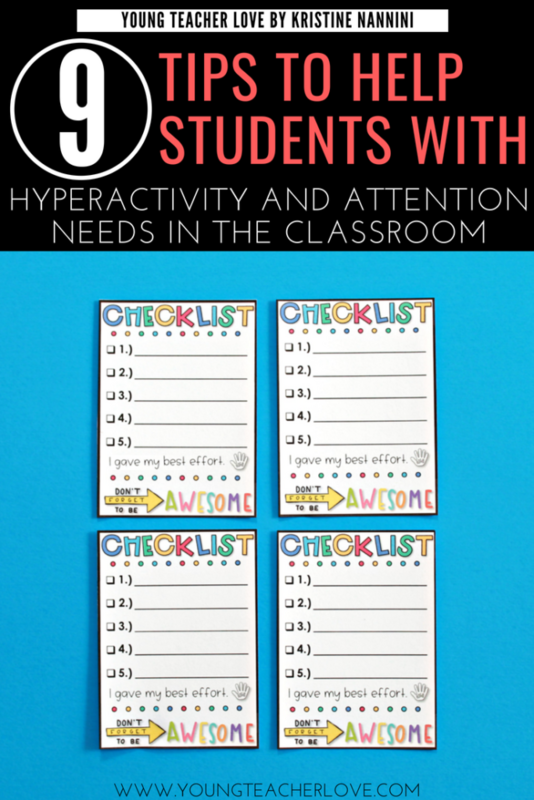 For example, one student may have trouble starting a new task, another student might lack the attention to focus on any one task long enough to complete it, another student might have trouble multi-tasking, another student might struggle to remember what they need to do, some students may struggle with prioritizing and staying organized, etc. Each student is different and has different needs. 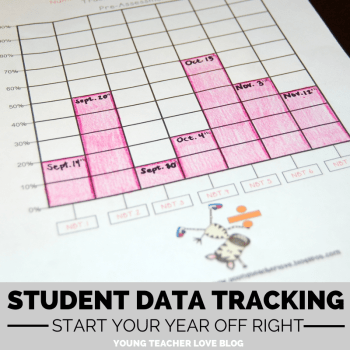 Learn about your students, try different interventions, and use data to determine if the intervention is working. 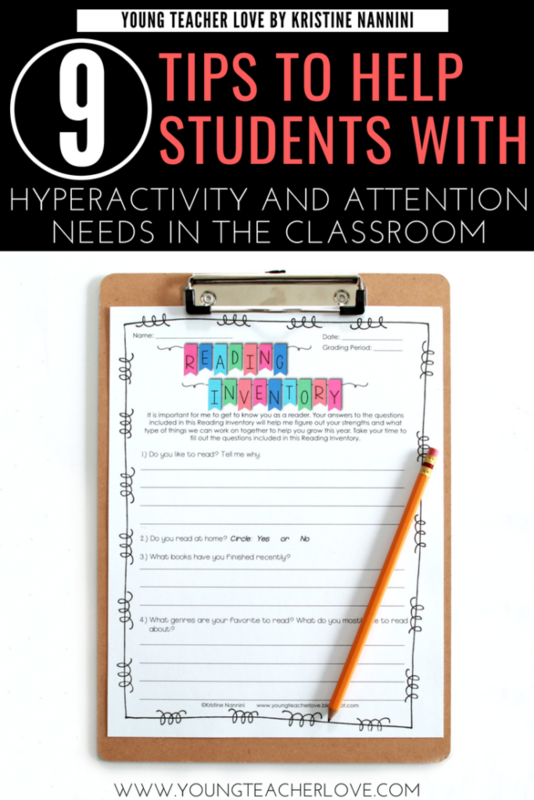 Reading tasks can be particularly tough for students with attention needs or hyperactivity. Reading involves sustained periods of attention and inactivity, both of which are especially difficult for learners with attention needs or hyperactivity. To overcome this, use only high-interest reading materials that students have selected for themselves. It can be comics, graphic novels, magazines, funny or interesting articles, etc. If you make the reading tasks enjoyable and short, attention and focus will stay high, and comprehension will improve. To get the best high-interest reading material in front of your students, give each student a reading inventory to figure out what reading material they would like, their strengths, who they are as a reader, etc. I have one available for free HERE. Once you figure out the students’ interests, you can obtain some of these reading materials on your own, encourage students to bring their own, reach out to parents, PTA, etc. for donations, or check out books from your local library in a pinch. Remember, the material doesn’t have to be a book. This is a good time to get creative and let them read something that doesn’t feel like an assignment. This is self-explanatory. 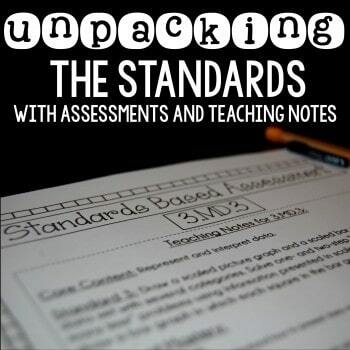 If your students easily forget things, become overwhelmed with multi-tasking, can’t keep track of assignments, or are having trouble prioritizing, come up with a system for them. Log all assignments in a planner or list and prioritize the assignments so they understand exactly what they should be doing in class and at home. You may even need to go a step further for students and write out the step-by-step process for completing one assignment. It’s very easy to sneak over to a student’s desk to write out three to four steps for them to follow after you have explained the assignment to the class. Regularly check their list/planner to update and organize to-dos for them. Also, if needed, get parent signatures on student planners each day so that parents are informed and involved. Below is an example of a list I used with my students. I laminated these lists so that students could re-use them each day. 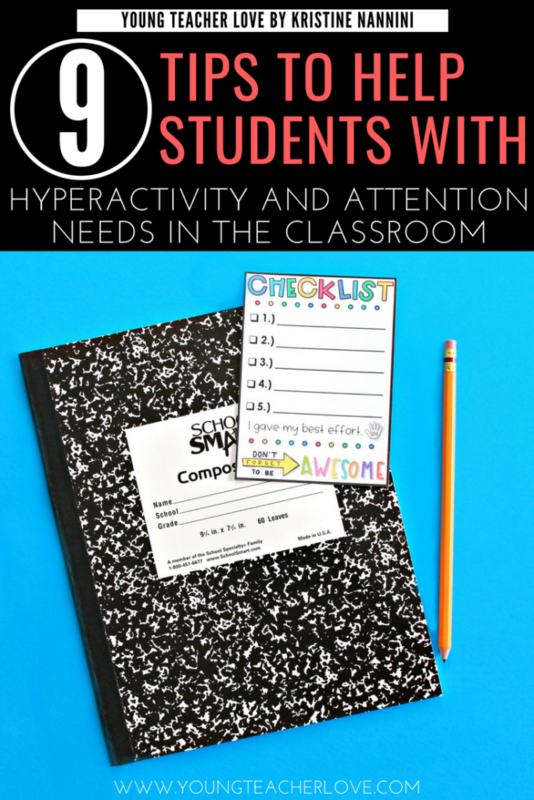 Depending on what your student feels comfortable with, you can either tape the list to the corner of their desk or let them put it inside their desk so that it’s a bit more discreet. You can click HERE to grab this free resource. You can also hand them out to students for individual assignments. Some students may need step-by-step directions written out for individual assignments. Video games use this trick to get people hooked. A typical video game uses a feedback loop of action –> reward that keeps you coming back for more. It’s easy and pleasurable to get the reward, which is why your kids keep coming back to it. Use this same psychology with your next lesson, assignment, or project by creating small objectives that they can cross off as they complete them. The human brain is wired to pursue rewarding behavior, but unfortunately, our brains take the path of least resistance to that rewarding feeling. Finishing a difficult project will activate the reward center of our brain. However, most people would rather settle for the easier options such as watching a TV show or browsing the internet because they provide the same rewarding feeling with less energy and stress. Sometimes, the only motivation to do a difficult task is when our stress hormones increase to panic levels. 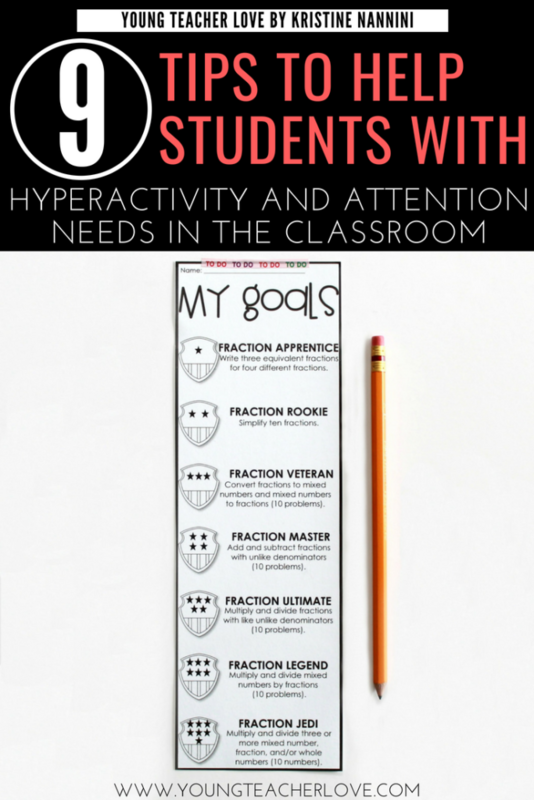 Using incremental goals will motivate your students to complete assignments for enjoyment and pleasure instead of just pure stress avoidance. For example, if you assign fraction practice problems, you could create an achievement list with several objectives. You can grab this freebie by clicking HERE. 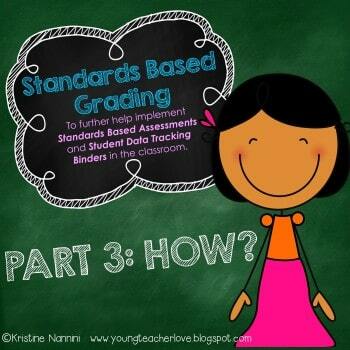 You could even take this information and make badges of the newly earned titles for students to keep, display, etc. This is a simple way to get students to feel like they are earning something. It gives purpose to the assignment and helps motivate them to achieve the goal. I’ve found that my students with hyperactivity, ADHD, or attention needs do best when they have a special seat of their own. Many teachers use flexible seating which is also a wonderful way to meet particular students’ needs. You have to do what works best for you and your students. I always offer my students with ADHD or attention needs other seating arrangements to see what they would like best. I never force them to sit by me or sit alone. However, I will say, that when students are given the opportunity to either sit by me or sit alone, they love it! It’s almost like extra-special treatment! When students sit alone by me, they get their own quiet area free of distractions from other students. Also, try to orient their seat away from windows, doors, and other students to eliminate visual distractions as well. This arrangement also helps because it allows you to easily check on the student to ensure they understand instructions and are able to start assignments on their own. 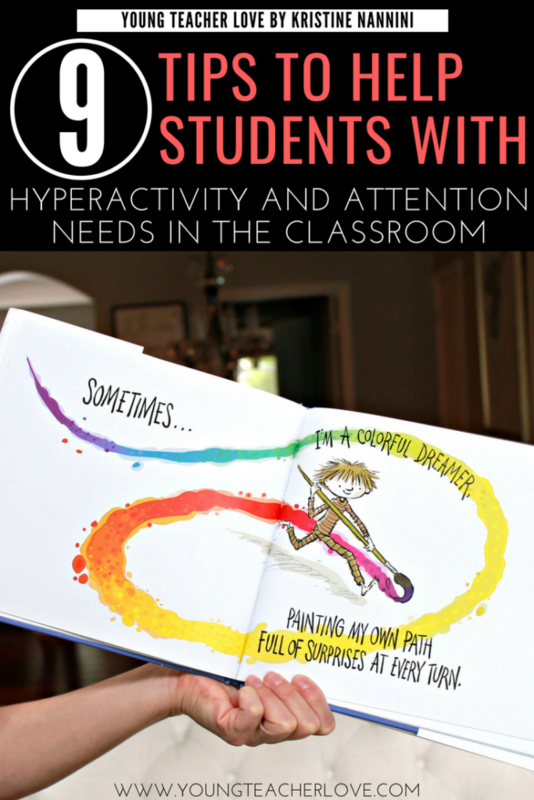 Students with hyperactivity, ADHD, or attention needs have to move, so let them. However, try to facilitate this movement, so it causes the least amount of distraction as possible. If the student must tap or click pencils, etc. try to find some type of fidget object (fidget toy, fidget bands, etc.) that they can use at their seat that makes no sound. Also, depending on your student’s needs, allow them dedicated time to get up from their seat, exit the classroom, and move. You can build brain breaks into your day, they can go on a quick walk to the drinking fountain, they can do jumping jacks in place, etc. To me, attention-seeking behavior indicates that a student needs help learning to get their needs met in a better way. I think it’s more appropriate to change the label to connection seeking behavior. Our students are really just seeking a connection with you and their classmates, and they are lacking the feeling of belonging or the significance that they need. In their mind, negative attention is better than no attention. So help them meet their needs in a constructive way. When the child is acting out, validate their feelings and support them. Try to redirect the negative behavior with positive connection-building activities. When a student is acting out, call them up to the board and have them help you teach or explain a concept, answer a question, or help you with any other task. Remember not to lose your temper and react to these students. Giving them a job makes them feel significant and seen. 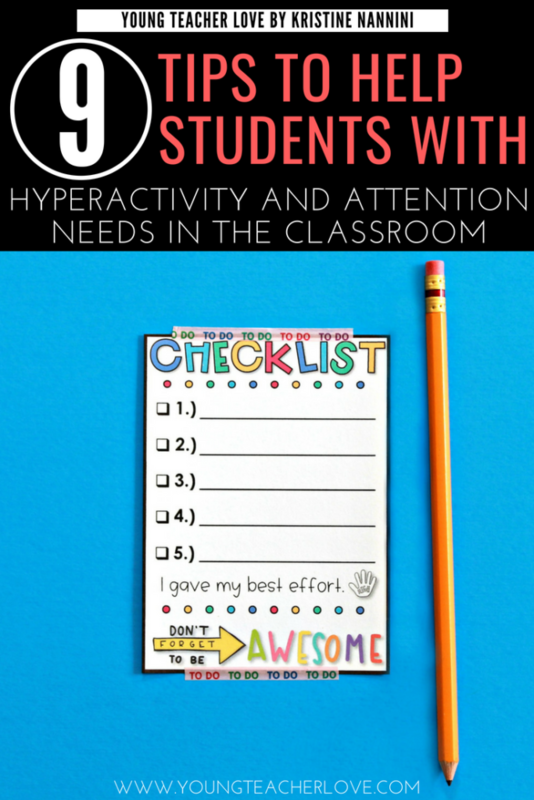 For students with hyperactivity or attention needs, it is critical to build strong routines. Students thrive on predictability and structure, and they thrive in an environment where expectations are known and reinforced. In this same vein, you also need to communicate changes in the routine well in advance so students have time to process the change. It also helps to have a visual display of the schedule posted somewhere. If necessary, it could really help a student to have the schedule posted to their desk to reinforce the routine. The best thing you can do is make your students know and understand that it is okay to be different. One of the best ways you can do this is through the use of picture books. 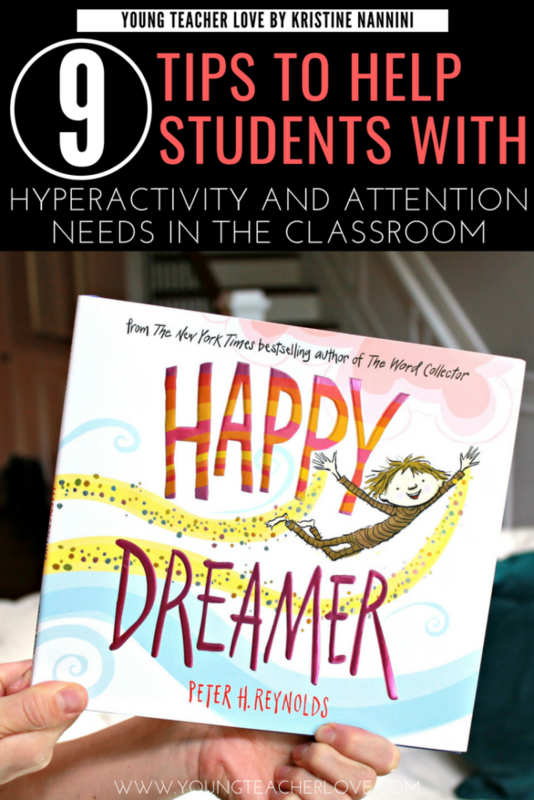 One of my favorite picture books is Happy Dreamer by Peter H. Reynolds. In addition, it’s important to teach inclusion to all of your students. 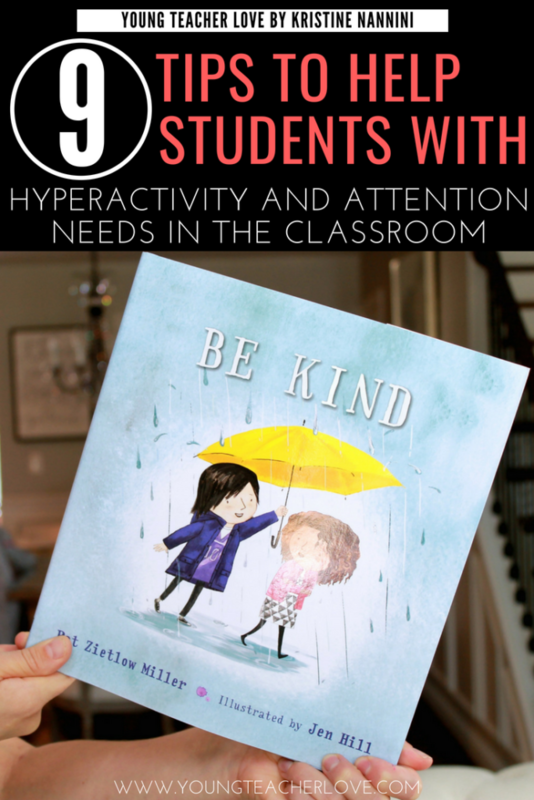 You can promote kindness and understanding in your classroom with books like Be Kind by Pat Zietlow Miller. Thank you very much for these timely tips. I am really grateful to you for sharing them and look forward to using them in my classroom to give my the kind of assistance and understanding that will help to meet their needs. Thank you so much for your kind words, Sharon! 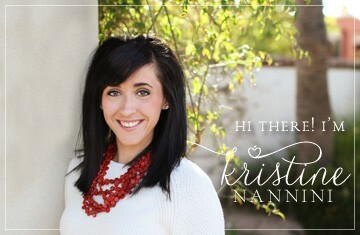 Thank you for this helpful information, Kristine! For some reason this year my patience has been thin and I have 12 students with special needs. I cannot keep track! I am having the most difficult time this year. Thank you for reminding me why I am doing this, and that is about the kids. THEY provide the answer as to how to best teach them. It’s all about them; it’s not about me. Thank you! Thank you so much for your kind words, Stevie! I am so glad this post helped you. This job is not easy, and your kids are SO incredibly lucky to have you.